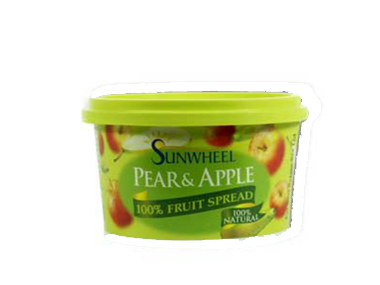 Order Sunwheel Pear & Apple Fruit Spread from the Online Health Food Store UK. Buy Sunwheel Pear & Apple Fruit Spread 300g and other quality Jams & Fruit Spreads safely online in the UK. Sunwheel Pear and Apple is a delicious blend of concentrated fruit juice with absolutely nothing added. Sunwheel Pear and Apple is a delicious blend of concentrated fruit juice with absolutely nothing added. Each 300 gram tub is produced by pressing 2.1kg of fruit to extract the juice, then boiling and cooling the juice several times until it becomes a concentrated paste. Once opened Sunwheel Fruit Spreads are best kept for up to 6 months in a cool dry cupboard. There is no need to refridgerate. Our UK Health Shop sells real Sunwheel and other Jams & Fruit Spreads from top-quality brands safely online to customers throughout the United Kingdom in England, Wales, Scotland and Northern-Ireland. View more products on the Online Health Food Store from Sunwheel. Where to buy Sunwheel Pear & Apple Fruit Spread safely online? Shop at the Online Health Food Store if you are wondering where you can buy Sunwheel Pear & Apple Fruit Spread 300g safely online in the United Kingdom. Our Health Shop is located in the UK and our award-winning independent has been serving customers in England, Wales, Scotland and Northern-Ireland since 1976. You can buy our Jams & Fruit Spreads online and we post out orders to any UK address. Pear & Apple Fruit Spread - Sunwheel Pear & Apple Fruit Spread 300g in Jams & Fruit Spreads and Honeys, Jams & Spreads.